PlanetMike: Camden Cyclists googlemash bike map of London. 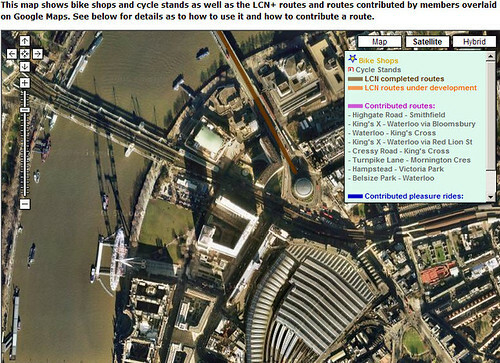 Camden Cyclists googlemash bike map of London., originally uploaded by mike1727. Camden Cyclists, an inner London cycle campaign group, have this excellent googlemaps mashup on their site which shows overlays of bike shops and routes. The combination of high resolution satellite imagery with vector overlays of routes in excellent since it adds a feel for the route which you can't get from a map alone- size of roads, complexity of junctions, shortcuts etc. They hope to add bike rack locations soon, though the ultimate mashup would combine this with a door to door routefinder- enter start and end locations and get a bike-friendly route map using quiet or less quiet roads according to your preferences. Resources like this are a boon ror occasional London cyclists like me- I tend to go everywhere by tube when I'm in London, so it's difficult to relate to surface routes.